By jpower on March 16th, 2010 . 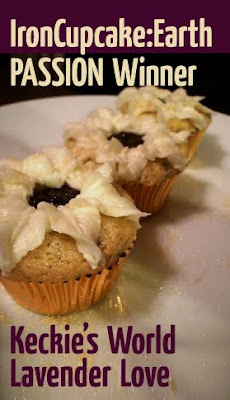 Filed under: Blogs, Contests, Cupcake Ideas, Recipes, Reviews . I was cruising the cupcake blogosphere when I noticed that not only is No One Puts Cupcake in a Corner a good blog with a hilarious title, it is also the host of the cupcake challenges Iron Cupcake Milwaukee and Iron Cupcake: Earth. IC Milwaukee, I expected, seeing as the blog is brought to us by the Milwaukee Cupcake Queen. But Iron Cupcake: Earth? Holy crap. That is like the World Cup of Cupcakes. If you’re in the mood for a very adult cupcake, this is definitely it! The flavors in this one are mature, subtle, and layered. The cupcakes have a distinct fruity olive oil undertone, which is lighted by lemon and sweetened by the blackberries. The lavender gives the entire cupcake a lightly floral aromatic quality. There is a hint of salt to add the the complexity of the final flavor. These are some serious cupcakes! That sounds like a fine fancy cupcake. Also, flowers plus cupcakes plus olive oil equals good for your heart! If you want to throw down the gauntlet with cupcake bakers from around the globe, you too can join the Iron Cupcake: Earth Challenge. Just email the Milwaukee Cupcake Queen your information (first and last name, city/state/country and blog web address) and keep an eye on the Iron Cupcake: Earth blog for announcements about upcoming challenges. 1 Response to Iron Cupcake: Earth!